Recently I counted about 228 judges listed on the Canadian Judges Association website. Many of those judges are on permit, awaiting assignments. Nearly half of them still had groups to finish in order to qualify as all breed judges. Therein is the problem. I think back to a discussion we had at the Sault Ste Marie Kennel Club where someone -who does not show in conformation- stated that at our dog show we should only have all breed judges. That is the usual philosophy especially when you are running limited shows--one judge for 175 entries, the exact number a judge is allowed to judge per show. It does cut costs but it also tends to cut the number of entries. Instead of getting the planned-for 175 entries, frequently the entries are cut to 139 or 100. Do those that concentrate on rally and agility really care? I wonder. I give the CKC credit when they amended limited shows to 200 dogs per show instead of 175. Perhaps it was an effort to encourage shows to employ more permit judges in their panels. I don't think it worked. When dog clubs ignore this move and limit entries at 175, CKC efforts to Increase judges fails and the dog game fails. I am not the only judge that has packed it up or died because of age and the recent show I attended reinforces that idea. I can imagine myself groping around in the ring, bending over each dog, trying to be nice to each exhibitor, while I ache all over, instead of sitting outside the ring like I do, analyzing judges choices and conferring with people about dogs. Large or small I love dog shows and think it is partly because of talking to dog people about dogs. New judges have to be developed and in my opinion some clubs are made better employing judges who are still on permit. Clubs have to do more than providing classes and putting on one show a year. They have to have practice shows where they teach their young people how to judge and they then support and promote those judges as they work through the system. There are ways that judges themselves can keep getting more groups if only clubs don't keep cutting off opportunity for permit judges. When I was in the process of getting to all breed status, I volunteered as show chairman for our shows in Markham, there certainly wasn't a lineup wanting to do it. When judging myself I would constantly look for judges that were fair, efficient and displayed a knowledge of dogs. (What better place to look for judges?) I can't remember any that were not well received and suited. Then there are handlers, that is where most of the judges come from, their time at shows includes studying and learning about dogs, meeting people and getting to know what dogs are supposed to be and what it takes to win. It is where future judges learn and from being in the dog game for so long I realize that we all never stop learning. At the last show I got to go over a few dogs, simply by asking. I learned that the size of Beagle ears is a consideration, (never thought of that) The more you are around dog shows the more chance of graduating to becoming an all breed judge--but it takes time. I can't remember ever actually judging a Pekinese but I discussed them often with breeders, handlers and Nigel Aubrey Jones, the considered authority. I asked a handler if I could go over Pekinese while at the Sudbury show. After we left the Pekinese went BIS. Although no longer judging I am still learning. Deep within the dog show game is a suspicion that there is collusion and dishonesty in the way the winners are selected. If this is so how am I (and others) able, on occasion to sit at ringside and pick the winners without any prior knowledge of who the dogs were or their owners? However there is also the power of persuasion and publicity around promoting extensive wins can tend to make some judges look at the record instead of the dog. From my perspective though, multi winning dogs are usually worthy. Dog shows should educate people as to what purebred dogs are supposed to be, in soundness in structure, health, and temperament. Dogs that are a discredit to any breed should have no place in any dog show. We are selling a product to the public, trying to convince people that a purebred is better. 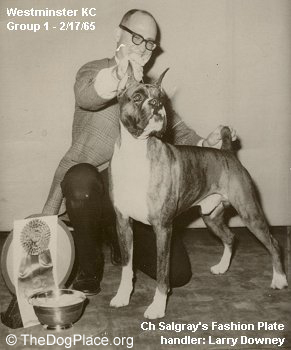 Dr. Richard Meen wrote of the specialty shows being the best format to teach people what each breed should be; true they do give people a chance to see numbers of dogs of the same breed and to see what is winning. Yet I have talked to people that have been around the dog game for years and years that have based their "expertise" solely on the dogs that have won, without any knowledge of why they have won. In the big entry shows I have watched with American judges I have picked out the top dogs knowing nothing about them except for quality. I looked at them the same way when watching Crufts and Westminster shows on TV judging by what I call the Universal Standard. The German Shepherd breed that flourishes on specialty shows diverge from normal principles of balance and although they are one of the breeds that is still doing the work they were initially bred for--herding, tracking, seeing eye and police work--the dogs chosen for this work do not come from specialty show selection.